You might not associate the term “insulation” with your garage door, but it’s actually extremely important. If you’re considering a replacement, make sure you consider garage door insulation as closely as you think of the style of the door, the material it’s made of and any accessories it may come with. At Action Garage Door, we can help guide you through the election process so that you make the best choice for your home that takes all of these factors into account. Garage door insulation is particularly vital if your garage is connected to your home. Not only is your door then largest moving object associated with your home, it also offers the most protection from the elements. The better-insulated your door, the better job it will do of maintaining the temperature in your garage. This will go a long way toward decreasing the costs of cooling and heating your home. In addition, the more insulation the door has the better it will be able to keep moisture out. It will also do a more effective job of reducing noise. There are two main ways you can check for garage door insulation – R-value and the way the door is constructed. 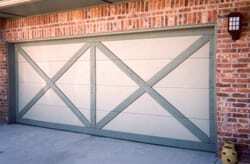 R-value is a measurement of a garage door’s thermal resistance to heat flow. Very simply, the higher the R-value, the more insulation it offers. If the door has triple-layer construction, that means it has thermal insulation between two layers of heavy-duty steel. This helps improve your home’s energy efficiency by reducing the amount of thermal energy that can pass through the door. If you have any questions regarding garage door insulation, or you would like to know more about having your unit repaired or replaced, the experts with Action Garage Door would love to hear from you. Contact us online or give us a call at 972-215-7906.